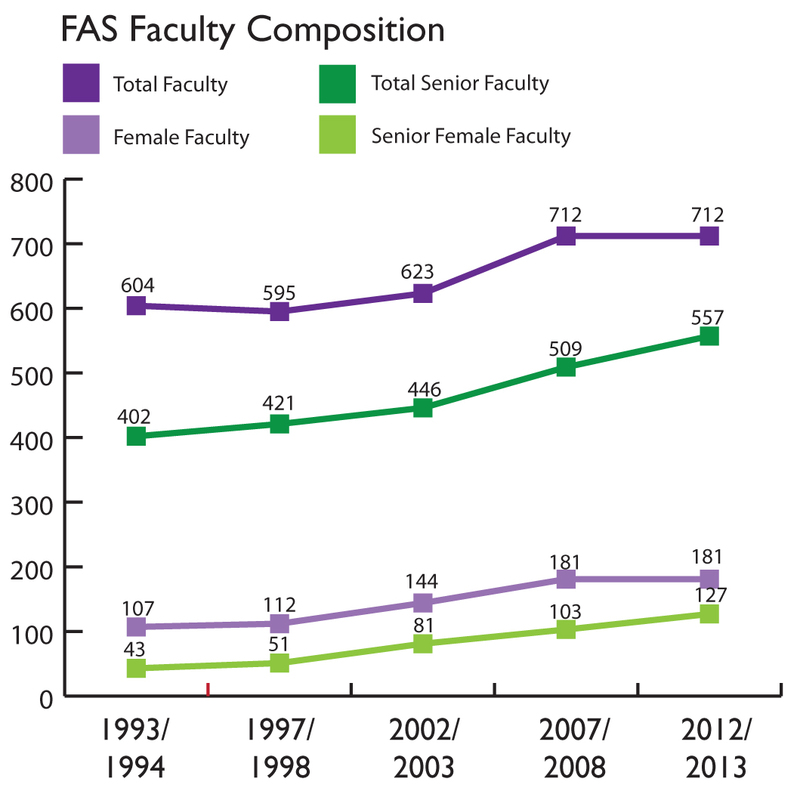 Women now hold nearly 23 percent of the tenured professorships in the Faculty of Arts and Sciences (FAS), more than double their 10.7 percent share of 20 years earlier: they numbered 127 of the 557 senior faculty members during the 2012-2013 academic year. Yet their representation in the faculty’s total ranks, including junior professors, has risen far more slowly, from 18 percent in 1993-1994 to 25 percent now (181 of 712 faculty members)—and the latter proportion has held steady since 2007-2008. That reflects stubborn limits in the gender composition of tenure-track faculty: the female proportion has fluctuated between roughly 30 percent and 40 percent for nearly two decades—and recently declined to 35 percent. Several factors complicate hiring at Harvard, Kramer continued. When hiring slows, as it has since the recession began, a “conservative effect” takes hold, in business and in academia, making every search more protracted, and perhaps inducing those hiring to look for people most like themselves. Moreover, FAS continues its slow transition to a tenure-track system, raising the bar for junior-faculty appointees (who were formerly regarded as more likely to be short-term colleagues). Finally, she said, women candidates may be conservative about where they apply—and avoid institutions lacking a strong history of internal promotion. In response, Kramer said, “We want departments to think about these issues” as soon as they contemplate a search. That means analyzing their own composition vis-à-vis those of peers elsewhere. It also requires “tracking” the pool of talented young scholars from the time they begin making academic presentations and earn degrees, to know where to find the best candidates. The most successful departments, Kramer said, citing other institutions, are “always in search mode.” Lest these steps seem onerous or unnecessary, she said, FAS dean Michael D. Smith is “very concerned about this issue”—as he made clear during the early-April faculty meeting where Kramer spoke. FAS’s dean for faculty affairs and planning, Nina Zipser, is responsible for translating that concern into action. In an interview, she cited two ways of ensuring effective searches. First, echoing Kramer, she pointed to gathering good data, including annual examinations of the “vibrancy, depth, and career stage” of all the candidates in a specific field so that a search can be proactive, rather than limited to submissions that arrive after its launch. “We need to have a culture that is much more cognizant of everyone who is coming out” of the pipeline, she said. Second, Zipser said, departments need “really good search practices” that counter “implicit biases that preclude candidates who aren’t traditional.” To that end, with the help of Cabot professor of social ethics Mahzarin R. Banaji, senior adviser to the dean on faculty development, Zipser’s office has promulgated revised “Recommendations for Ensuring the Integrity of Faculty Searches” that reflect current research on factors that can lead to less optimal outcomes. (Orchestras, for example, famously evaluated musicians differently when candidates performed anonymously.) Tenure-track search committees are urged to include tenure-track as well as senior professors. Search criteria should be set in advance, to avoid the risk of tailoring them for a preferred candidate. And written evaluations should be sought, lest any faculty members, particularly junior ones, feel inhibited about speaking out. Such ideas, Banaji said in an interview, are widely available in the research literature, but the knowledge “seems disengaged from real decisionmaking.” Businesses where she has lectured, and which hire regularly, are eager to adapt their practices to better serve customers and shareholders, but academic recruiting—more limited and episodic—has been slower to change. In general, she said, people “don’t know how to make good decisions,” but “we are discovering what gets in the way.” The guidelines aim broadly at shedding light on implicit biases in recruiting, and instilling processes that get better information before decisionmakers. Within the psychology department, for instance, Banaji said, faculty members must now attend a candidate’s academic presentation, or at least watch it on video, before voting; in years past, there was no such requirement. “Every generation will have some lack of imagination about hiring the next,” Banaji said. Now, when “everything is up for grabs in appointments” (candidates’ genders, ethnicities, degree-granting institutions), she added, it is essential for the scholars who appoint the next cohort of FAS professors to pause to ask explicitly, “Are we making decisions that are in Harvard’s best interest?” Among brilliant professors, the most humbling recognition might be, as Banaji put it, “This is not about being smart—it’s about being human” in making those choices.